For years the carbon-suppression lobby has been trying to focus public controversy on the issue of whether anthropogenic global warming (AGW) is “real” or whether there is a scientific “consensus” that most warming of the past 50 years is man-made. In their preferred framing of the debate, accepting the reality of AGW or the supposed “consensus” logically and morally demands acceptance of their policy agenda of cap-and-trade, carbon taxes, EPA emission standards for power plants, Soviet-style production quota for renewable energy, Stimulus loans for Solyndra, blocking the Keystone XL pipeline, and the like. Hogwash. As my organization, the Competitive Enterprise Institute, has argued for the past 16 years or longer, the core issue for policy makers and the public is whether the risks of climate change outweigh those of climate change policy. Which should we fear more: climate change or the taxes, regulations, mandates, treaties, and other schemes supposedly needed to “solve” the “crisis”? 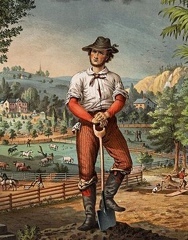 Farmers and farm groups have usually been opposed to government climate policies. A new study finds they are not so much skeptics of climate change as they are about the rules that may come with [it] and how they might harm their business. The new study, funded by the California Energy Commission, conducted by researchers at UC Davis and the Agricultural Sustainability Institute, and published in Science Direct, surveyed 162 farmers in Yolo, California. 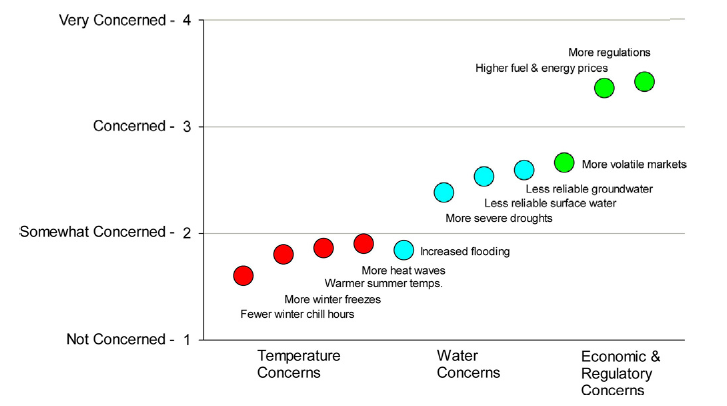 Figure explanation: Average level of concern for local climate change impacts. 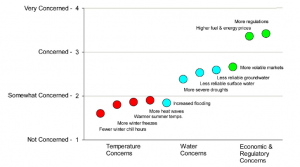 Farmers’ responses to the question, ‘‘How concerned are you about the following climate-related risks and the future impact they may have on your farming operations during your career?’’ Responses are ranked on a four point scale ranging from very concerned to not concerned. Note, farmers worry not only about the costs of regulation but also about how regulation could impede their ability to adapt to climate change. Although some too apparently regard regulators as oblivious to the costs of doing business. The study also found that “despite the negative perception of regulations, farmers did express interest in government technical assistance to aid with mitigation and adaptation efforts.” In fact, 48% said they would “participate in a government incentive program for climate change mitigation or adaptation. . .” Well, maybe that’s progress. It suggests a majority understand that government assistance won’t come without regulatory strings. You might also assume that farmers who had negative experiences with previous regulations would be less likely to have climate change risk concerns. Just the opposite, those with negative regulatory experiences were more likely to have concerns about climate change risk. Why? Apparently, because public perceptions of climate change risks are what create climate policy risks! For farmers with negative views of previous environmental policies, climate change risks may seem more severe if they are envisioning them to be heavily weighted toward policy and regulation.